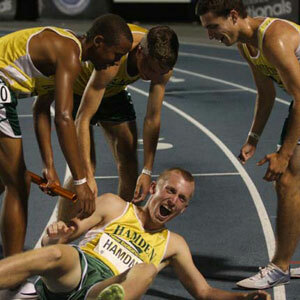 Villanova signee Chris FitzSimons from Hamden, Connecticut -- one of the top three 800 meter runners in the US prep ranks this year -- anchored the victorious 4 x 800 relay team tonight at the New Balance Nationals in Greensboro, North Carolina. He took the baton in 8th place -- over 4.6 seconds in back of the leader -- and stormed to the front to win at the tape (by .18 seconds). His split of 1:47.15 was the fastest of the day. Here are the splits from the fast heat (which produced the top nine teams overall): Race video is at bottom of the post.